I woke up this morning with pumpkin waffles in my head, although I'd never made any before. The version in my head was quite decadent with candied nuts and whipped cream, but I did not have those things (veiled reference to So I Married an Axe Murderer, you have to see that movie if you haven't!). Like any other day with a good idea, the internet is my friend. It is rare to find something that nobody else had thought of. This is why I have not yet posted the red velvet pancakes in my head - they've been in other people's heads too! In my searching, I came across an entire blog devoted to pumpkin waffles. 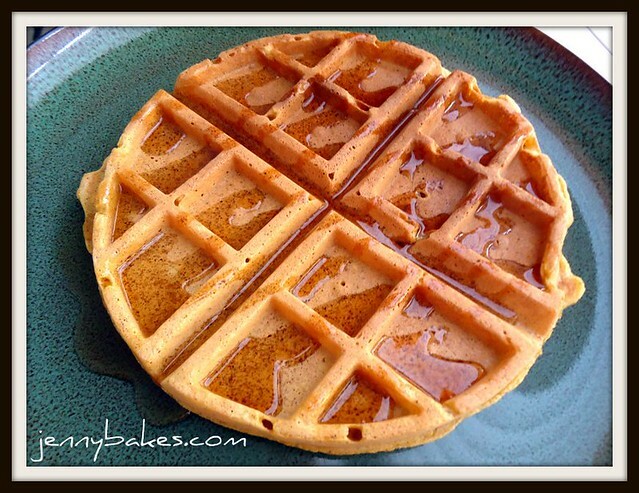 This blogger was not joking in her quest to develop a pumpkin waffle recipe! I knew this was the one I had to try. You can find this recipe on the Pumpkin Waffles Blog, pumpkinwaffles.wordpress.com. But since U.S. Copyright Law says that recipes can't be protected, I'm going to go ahead and copy and paste it here. The original blog has great photographs of the steps. If you make it, please head over to his/her blog and let him/her know how much you liked it. That's what I plan to do! This recipe isn't too sweet, the spices are nicely balanced, and you can actually taste the pumpkin. *Grated and lightly packed into the spoon, use 1/2 tsp. Grated and loosely scooped, this is about 1 tsp. of nutmeg. If you have to use pre-grated, dried nutmeg, use 1/4 tsp. 1. Lightly oil the waffle iron with vegetable oil, and set it to the desired temperature. 2. Combine brown sugar and cornstarch in a large bowl. Whisk together to break apart the cornstarch. Add the remaining dry ingredients, and whisk to blend. 3. Separate eggs: yolks go in a medium sized bowl and whites get set aside in a smaller bowl. 4. Add pumpkin and milk to the egg yolks. Whisk to blend and set aside. 5. Whip egg whites with a hand mixer on high until stiff peaks form - about 1 1/2 – 2 minutes. Set aside. 6. Pour melted butter into the yolk/milk/pumpkin mixture. As you pour, whisk to combine. 7. Add the pumpkin mixture to the dry ingredients, and mix them together until just combined. A little lumpiness is fine. That will smooth out when the egg whites are added. 8. Slide the whipped egg whites out of the bowl and onto the mixture you just prepared. Gently fold them in until no white bits are obvious. 9. Once the waffle iron is heated, you’re ready to pour the batter!